Did you miss the music? Here’s a taste. 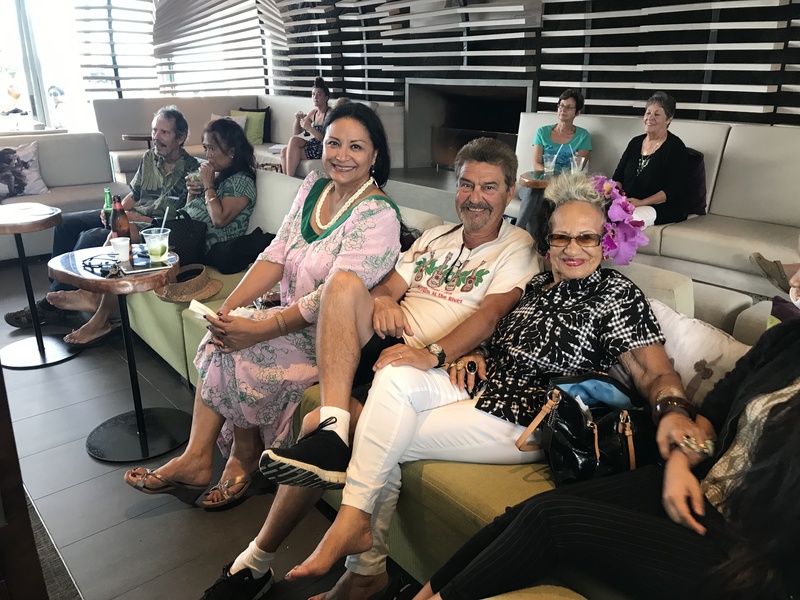 For those of you who missed the fantastic entertainment at the Grand Naniloa Resort lobby during the recent annual Banyan Drive Art Stroll, here are a few links to encourage you to seek out these award winning entertainers. Special thanks to Desiree Moana Cruz for making arrangements with these performers and to Pepe Romero, for his experience and his sound equipment to help these professionals sound their best. Christy Lena`ala Lassiter made her third appearance at Banyan Drive Art Stroll this year. Well known in Hawaiian music circles, her CD album Le`ale`a was nominated for 2017 Nā Hōkū Hanohano Awards for Album of the Year, Female Vocalist, Most Promising Artist, Hawaiian Music Album and Favorite Entertainer. There are several well known Big Island musicians on this album, including producer JJ Ahuna,, Dwight Tokumoto, Victor Chock, Ikaika Marzo, Lono Kanakaole, and Rob Yamanoha. Here is a link to “Hale Alani Swing” from Le`ale`a. Kainani Kahaunaele garnered several Nā Hōkū Hanohano awards including female vocalist of the year. Born on Kaua`i, she sailed from Hawai`i to Micronesia as a crewmember of the E Mau—Sailing the Master Home voyage in 1999, and now is a lecturer at UH-Hilo’s College of Hawaiian Language. “Sweet Makani” is her composition from her first CD Na’u ‘Oe. Mark Yamanaka was recognized as Male Vocalist of the Year twice by Nā Hōkū Hanohano awards in 2011 and 2014. His albums “Lei Pua Kenikeni” and “Lei Maile” were recognized with more awards including each being named Album of the Year. The Banyan Drive Art Stroll is held on the second Saturday of January each year. This year, sponsors included Friends of Lili`uokalani Gardens, Banyan Gallery, Suisan Fish Market, Hilo Bay Café, Pandamonia’s Paleta Palace, County of Hawai`i Parks and Recreation Department, Castle Hilo Hawaiian Hotel, Grand Naniloa Resort, Paradise Helicopters, Akamai Art Supply, and Cunningham Gallery. Thanks also go to Puna Taiko who performed outside Banyan Gallery and Hilo Bay Cafe, and to Cymber Quinn who performed at Wai`oli Lounge in the Hilo Hawaiian Hotel.